men have inalienable rights to think freely, to talk freely, to write freely their own opinions and to counter or utter or write upon the opinions of others.” Then again, as we have said, any “fruitful source of suppression,” becomes a “legitimate field for comment.” But in considering the LRH essays as regards governmental form, governmental redress and governmental tyranny, we are considering a far more extensive LRH commitment to individual liberty. As the classic case in point, he references his warning to former South African Prime Minister Dr. Hendrik Verwoerd, and his subsequent banishment from the nation. 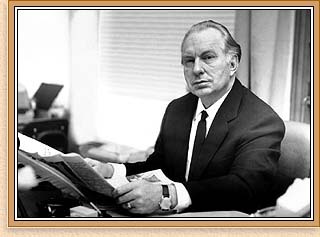 In fact, psychiatric interests in both South Africa and Rhodesia had declared L. Ron Hubbard persona non grata for proposing constitutions calling for the end of apartheid and the adoption of universal suffrage. As regards the state of governments in the era in which he wrote, let us add a few more words of explanation. In discussing the psychiatric front within United States federal corridors, he is touching upon that secret Cold War partnership between an American military and psychiatrists of ad hoc psychological warfare departments—principally a Psychological Strategy Board charged with input on nuclear counter-strike policies and what was described as the psychological components of a thermonuclear bluff. Also on the agenda were psychiatric recommendations for the policing of frightened populations and the actual instilling of fear—as in the calculated propagandizing of Soviet missile-strike capabilities to help engender support for annual military expenditures of some fifty billion dollars. Finally, in discussing popular revolt through these years, LRH is touching upon such matters as the 1968 Democratic National Convention where some twelve thousand dissidents—primarily students in protest of American involvement in Vietnam—descended upon Chicago for a bloody confrontation with local police, while another eighty million Americans viewed it all on television.